As a leading North American provider of maintenance management and asset management solutions, PCA was a key sponsor at SMRP Carolinas Chapter Meeting. 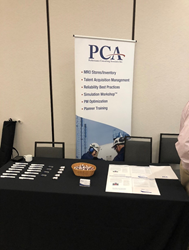 Performance Consulting Associates, Inc. (PCA), a leading provider of maintenance management and asset management solutions, sponsored and exhibited at the SMRP Carolina’s Chapter Meeting at the Embassy Suites Greenville Golf Resort & Conference Center in Greenville, South Carolina. The meeting held August 23rd – 24th, is an annual gathering hosted by the Society for Maintenance and Reliability Professionals, a non-profit professional society formed by practitioners to advance the maintenance, reliability and physical asset management profession. The meeting consisted of two days where solution providers and industry partners demonstrated products and services in the exhibition area, followed by a plant tour the following day. PCA is set to attend the SMRP 2018 28th Annual Conference on October 22-25, 2018 in Orlando, FL. About Performance Consulting Associates, Inc. Since 1976, Performance Consulting Associates, Inc. (PCA) has been providing maintenance and reliability “best practice” support to global manufacturing corporations across all industries. Based in Duluth, GA, PCA has been delivering engineering and consulting services for Asset Reliability, MRO Stores and Maintenance Management—and now, Talent Process Management, as well. For more on PCA’s Talent Process Management model and services, visit http://pcaconsulting.com/services/talent-process-management. For more information regarding all PCA services, please visit http://www.pcaconsulting.com.